Chock full of train scenes from start to finish, the movie Picnic was filmed trackside on numerous locations in Kansas. 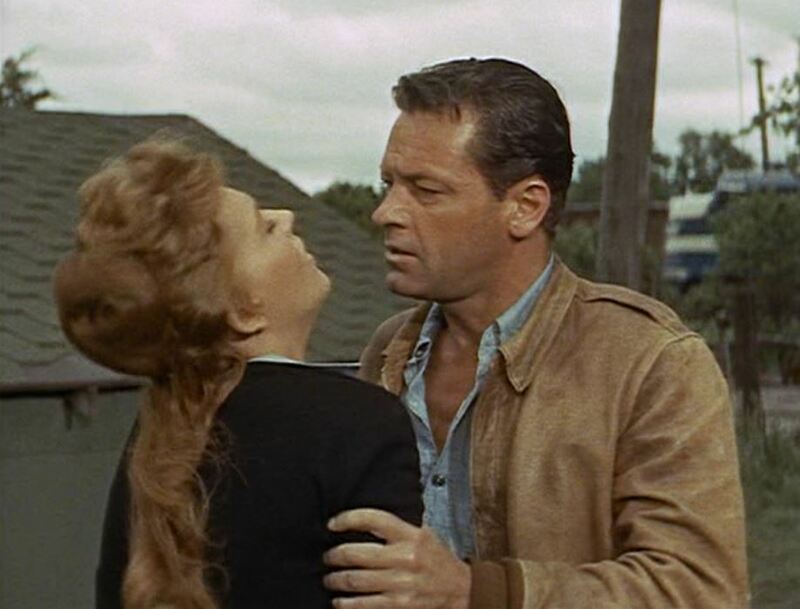 Starring William Holden (as drifter Hal Carter) and Kim Novak (as the town beauty, Madge Owens), this movie shows a slice of 1950’s railroading long-since vanished. 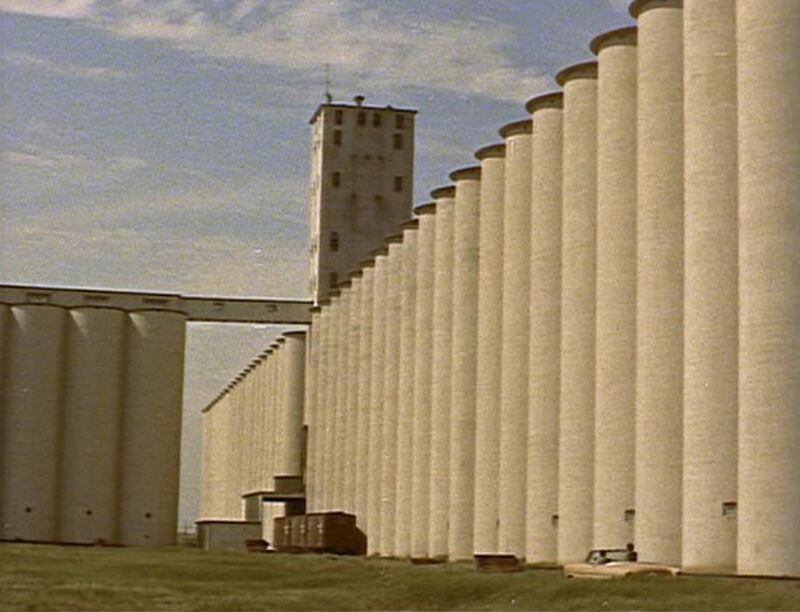 Towering grain elevators load wheat the old fashioned way….into 40 foot boxcars! Yep, no covered grain hoppers in sight and we get a glimpse of the first generation diesels that hauled it all to market. 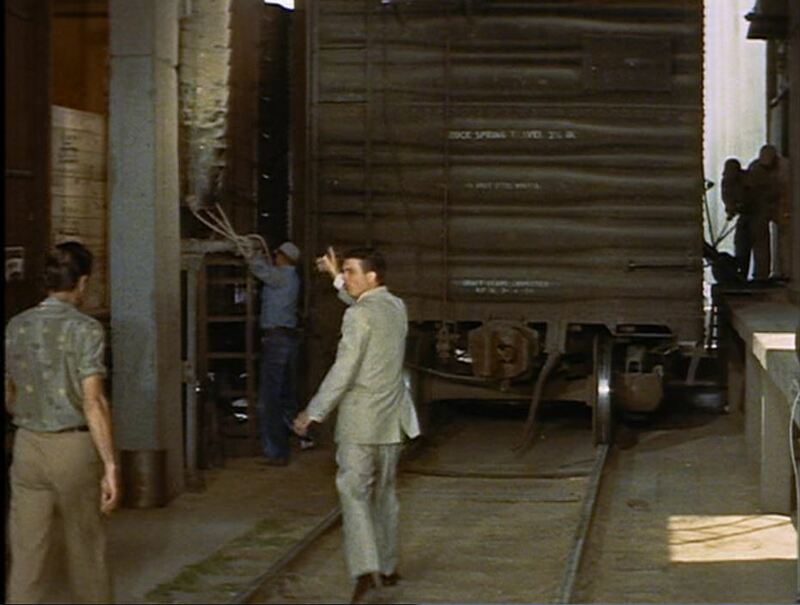 Let’s take a gander at how railroads so nicely fit in the background of this not-so-obscure train movie (which won two Oscars – Art Direction, Film Editing). Trains and Grain! That pretty much sums up this view of Missouri Pacific #35053 with the “buzzsaw” herald and “Route of the Eagles” slogan as a bank of grain silos rise in the background. 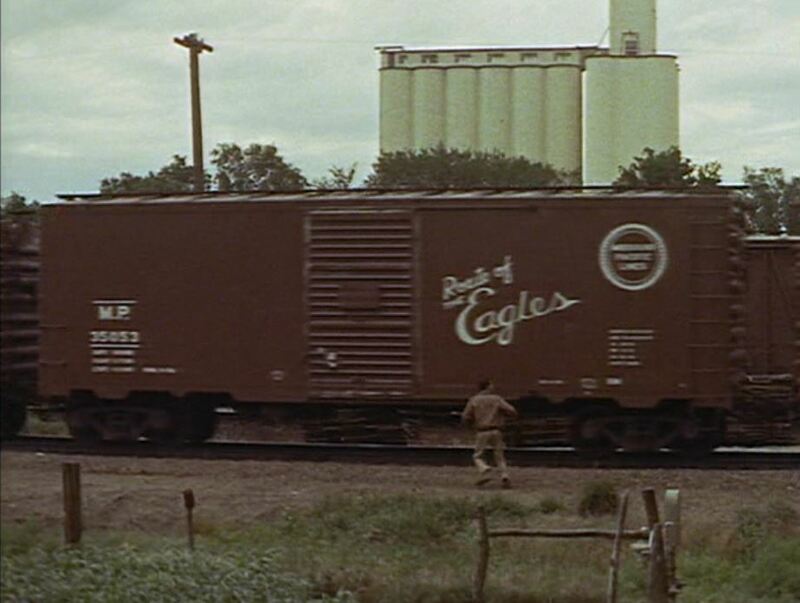 Even before the opening credits, here comes a Union Pacific EMD GP7 and a UP “Route of the Streamliners” boxcar trundling past the Salina (KS) Seed Company. 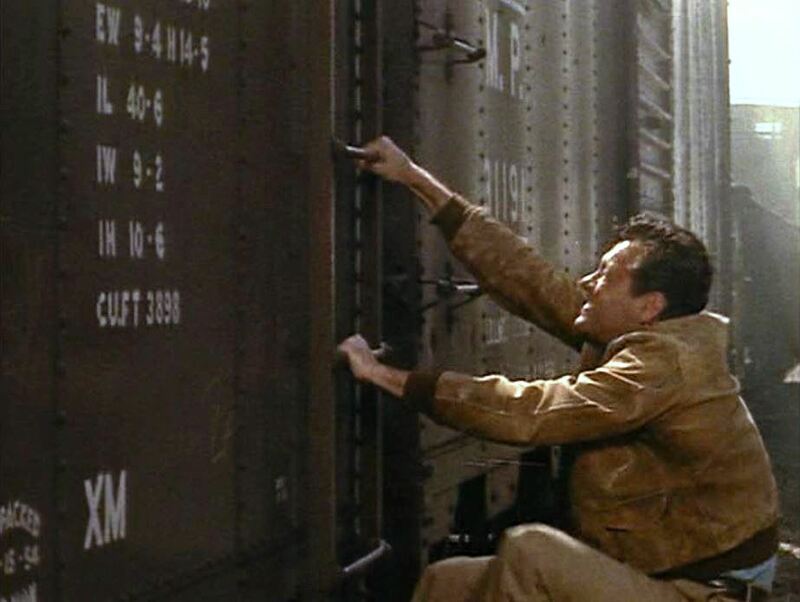 The congenial brakeman tells Hal Carter that this is his stop. 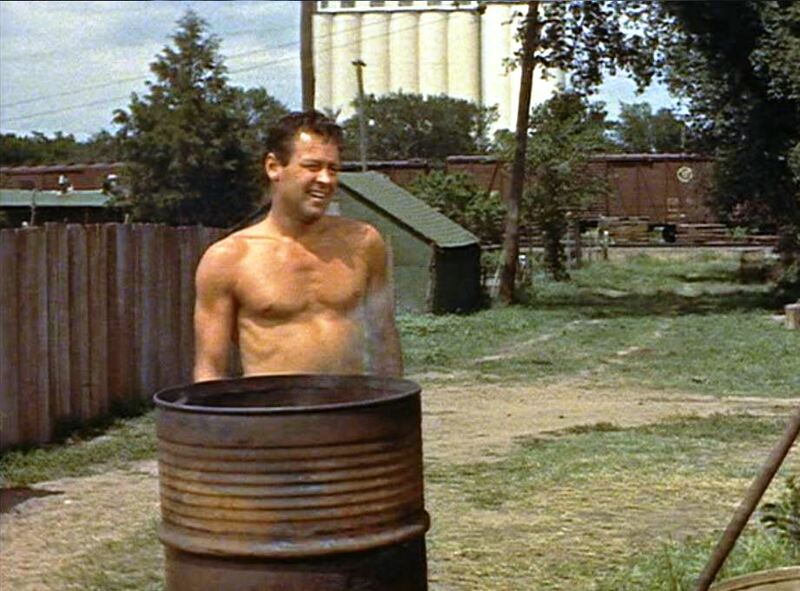 The disheveled hobo Carter alights from his “side door Pullman” and leaves the yard for a nearby waterfall to wash up. 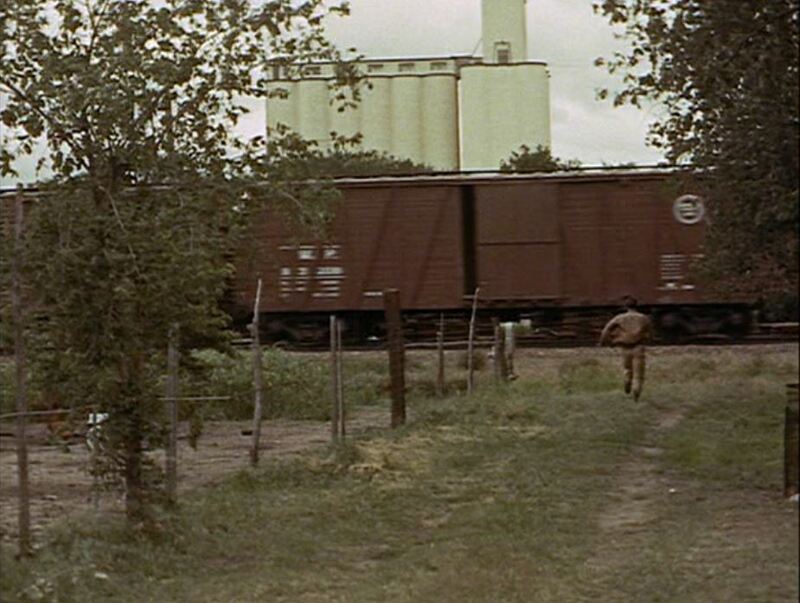 As the opening credits finish, we see Bill Holden walking along the UP tracks again in Salina, KS, then again approaching Madge’s house next to the MP tracks (Nickerson, KS). Boy meets girl. 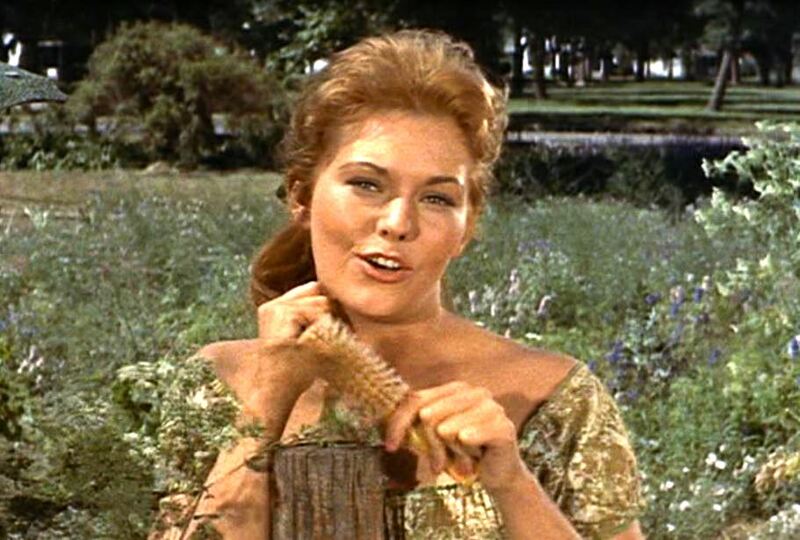 In a beefcake shot, Hal sees Madge (Kim Novak, rahr-RAHR!) for the first time with an outside-braced boxcar in the background. 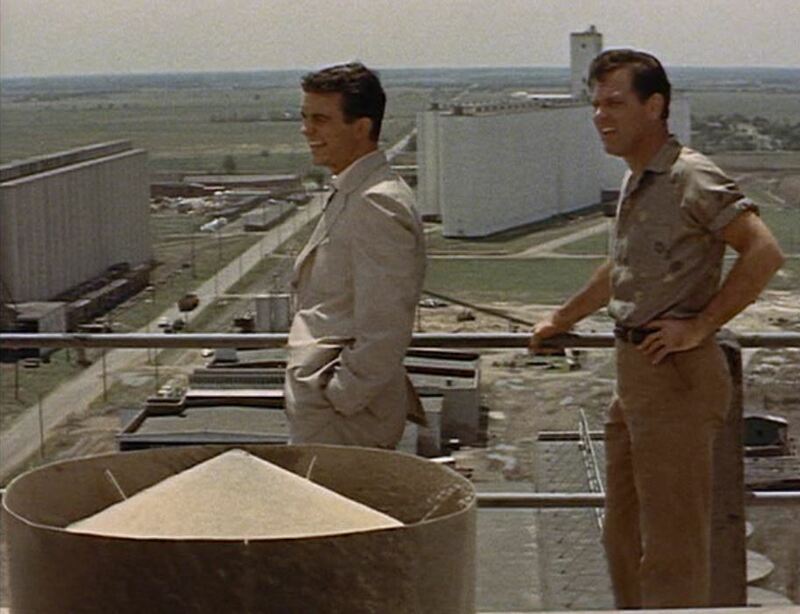 Long story short, Hal’s in town to look up his old college buddy, Alan Benson (played by Cliff Robertson), the richest kid in town — his father owns all the grain elevators. Hal’s arrival sets up a very juicy love triangle as Alan is Madge’s boyfriend. 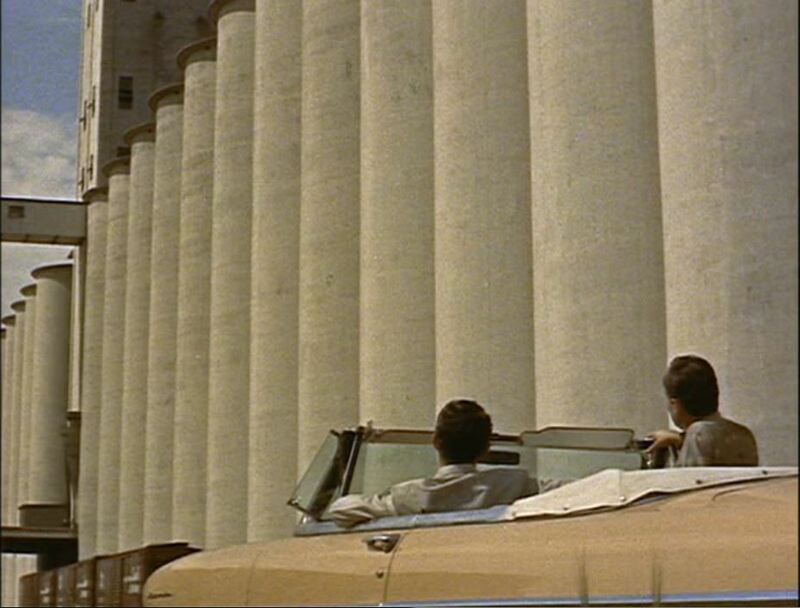 In short order, Alan is taking Hal around to see the massive grain structures. Whoosh! Alan demonstrates how grain is loaded into a box car. 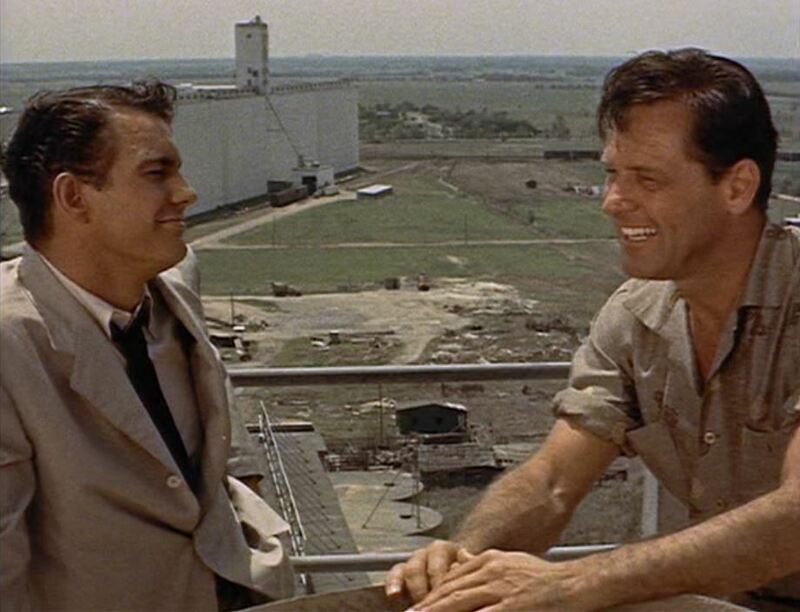 These scenes were all filmed in Hutchison, Kansas. 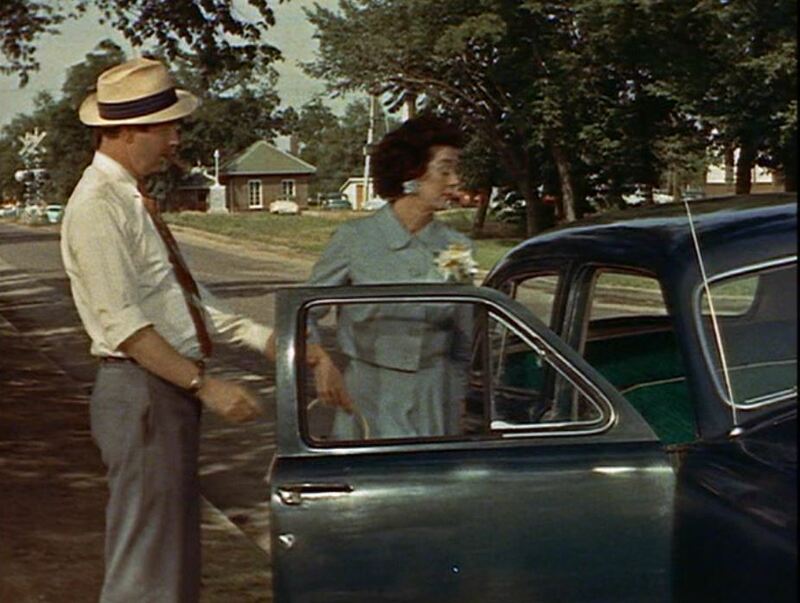 Arthur O’Connell and Rosalind Russell act in a scene and are included here SOLELY because of the nifty striped railroad crossing signals in the background! 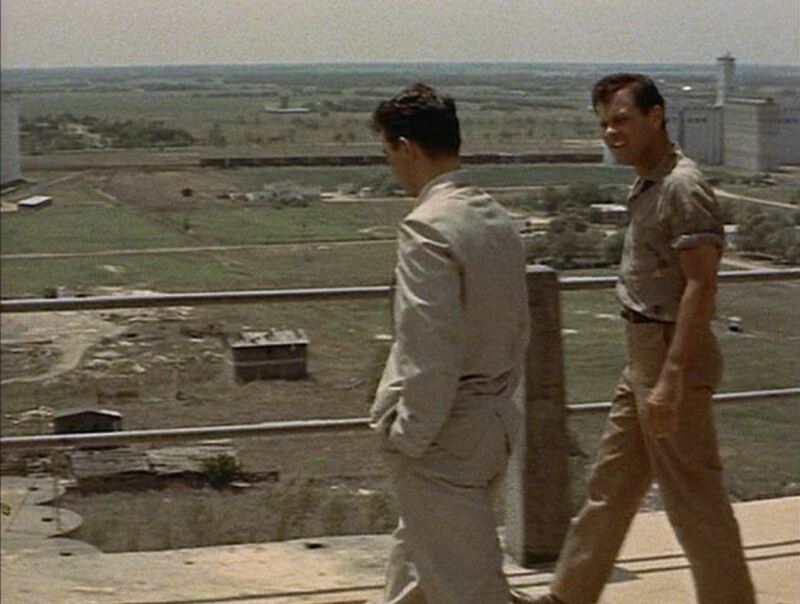 I believe this view was filmed in Hutchison, KS. 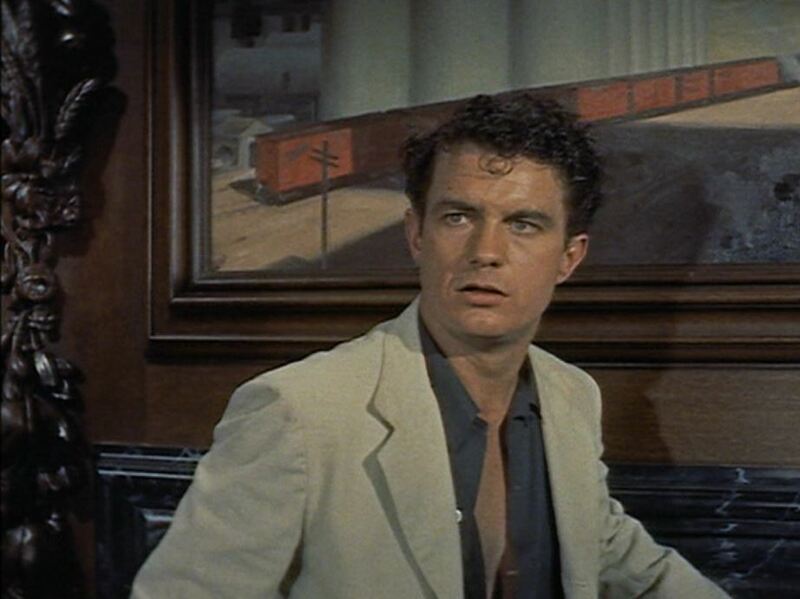 The second picture is Alan with an orange string of boxcars and grain elevator behind him in a painting (filmed on Hollywood soundstage). Leaving off the entire picnic scene…. 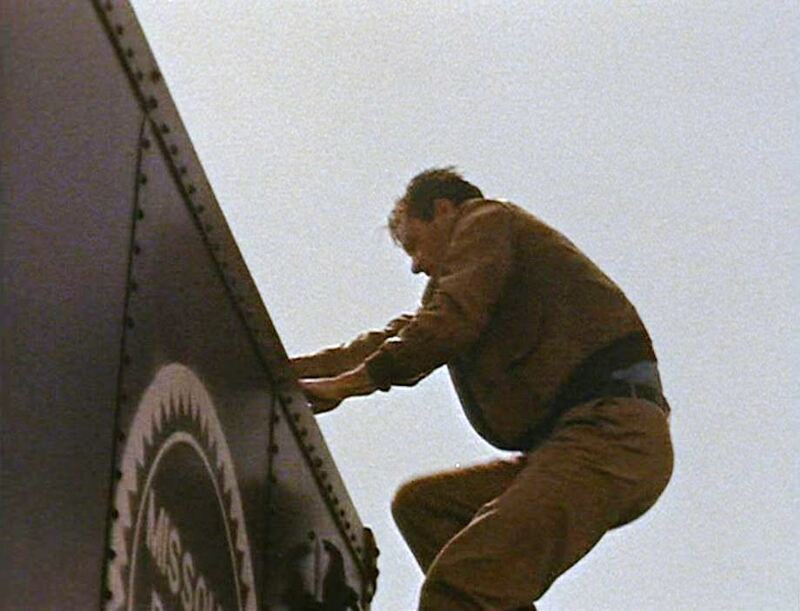 Hal runs to catch the train (note funky outside-braced MP boxcar), then climbs the side of another MP “Route of the Eagles” boxcar, waving a last farewell to Madge. 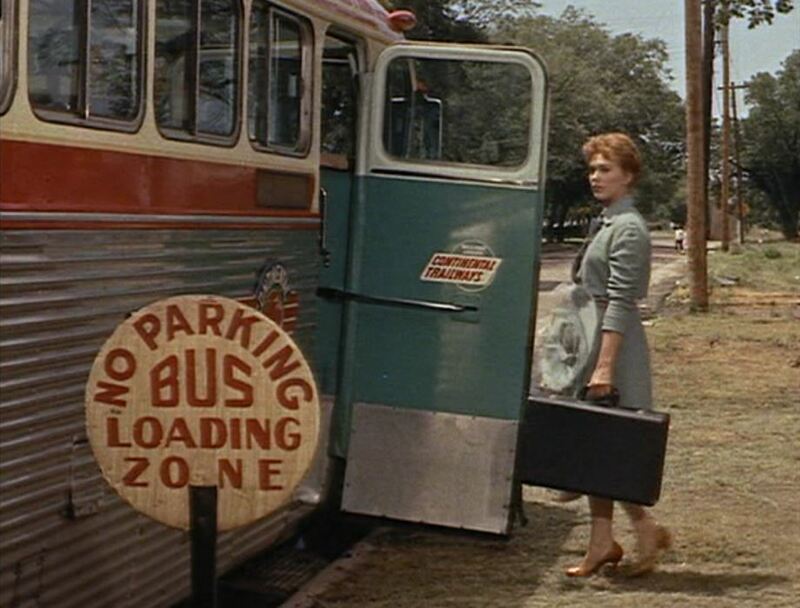 It’s not train-related, but here’s Madge boarding a neat old Continental Trailways bus to chase after Hal. 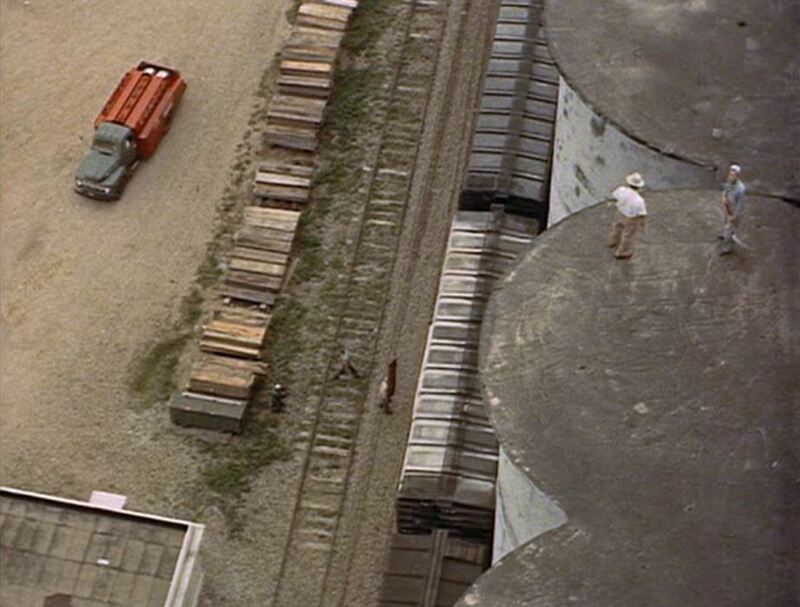 As the end credits roll, the filmmakers utilized one of the first movie shots taken from a helicopter. Note: Suddenly, Hal’s train is STEAM powered! 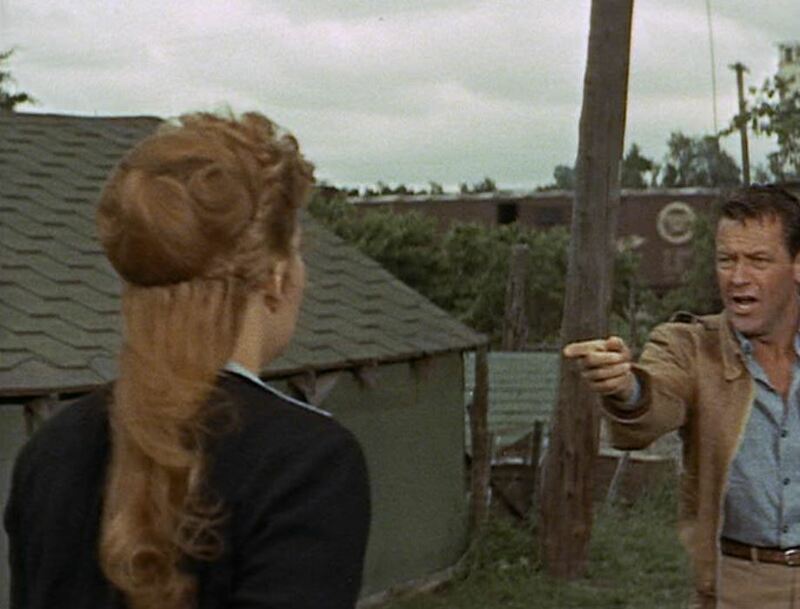 The movie Picnic is well worth a viewing, not just for the train scenes, of course, but also for the extensive location shooting as well as the solid acting and story. 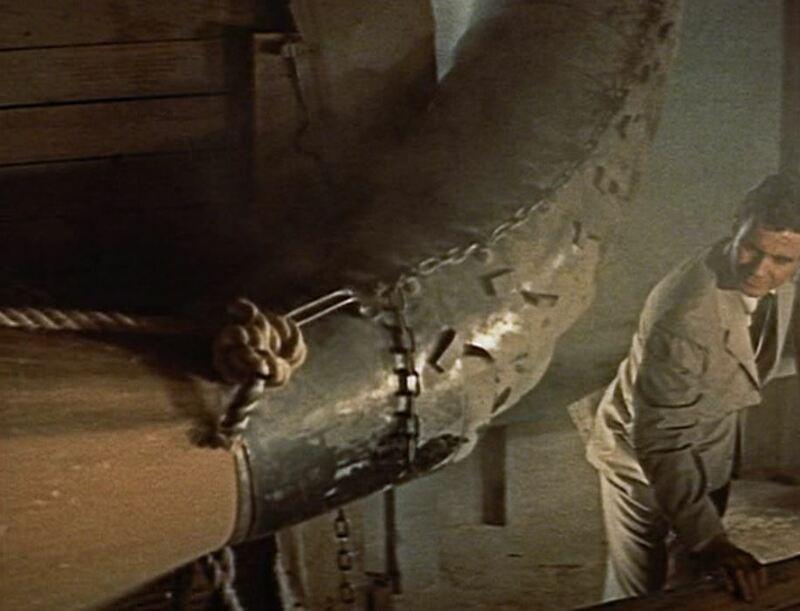 This is the sort of film Hollywood USED to make when entertainment and imagination carried the day. Check it out! I gratefully acknowledge George Duning’s website for helping pinpoint the railroad filming locations in Picnic. 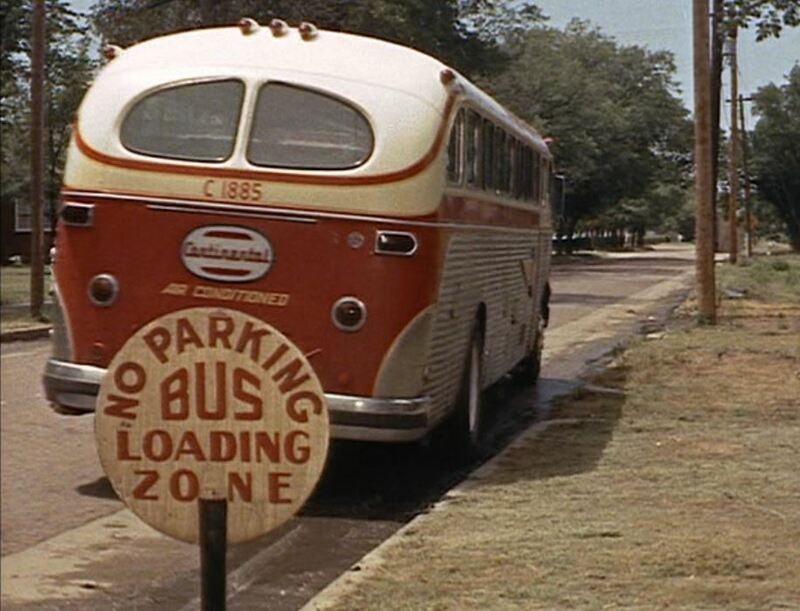 This entry was posted in Uncategorized and tagged 1950's railroading, 40 foot boxcars, Arthur O'Connell, Columbia Pictures, Continental Trailways bus, Grain Elevators, Hutchison, Kansas filming locations, Kim Novak, Missouri Pacific Railroad, Nickerson, Picnic 1955, Rosalind Russell, Route of the Streamliners, Salina, Union Pacific Railroad, William Holden. Bookmark the permalink.